ABC Family is getting a makeover. The Disney (DIS)-owned cable channel announced Tuesday that it plans to change its name to "Freeform" in January, aiming to attract television viewers who are 14 to 34 years old. The channel said it has dubbed that audience segment "becomers," because they are in the life stage of high school, college or the decade afterward and "are navigating the wonderful, fun, exciting, and scary time in life when you experience the most firsts." 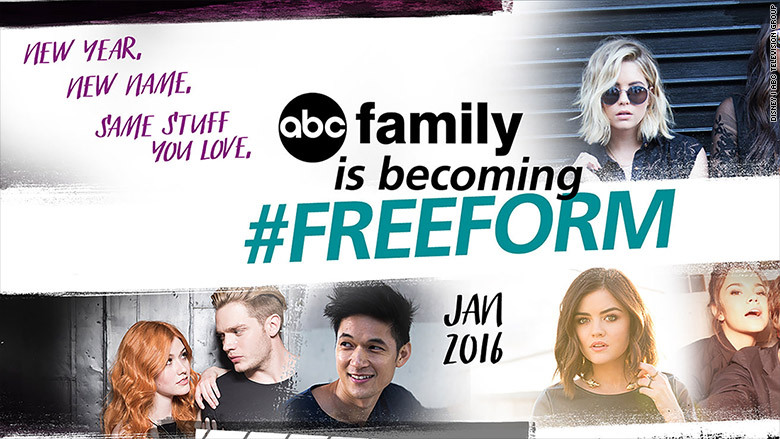 "Freeform evokes the spirit and adventure of our audience," said ABC Family President Tom Ascheim in a statement. "Freeform will deliver new, exciting original content as well as all the favorite shows our viewers already love on ABC Family." ABC Family has previously previous success with the "becomer" demographic. Variety reported in January that the channel had won the calendar year in its target young-female demo, averaging 250,000 women 18-34 during an average primetime minute. A phone call to ABC Family was not immediately returned.